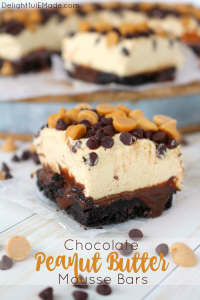 No bake cheesecake bars don’t get any better than this! 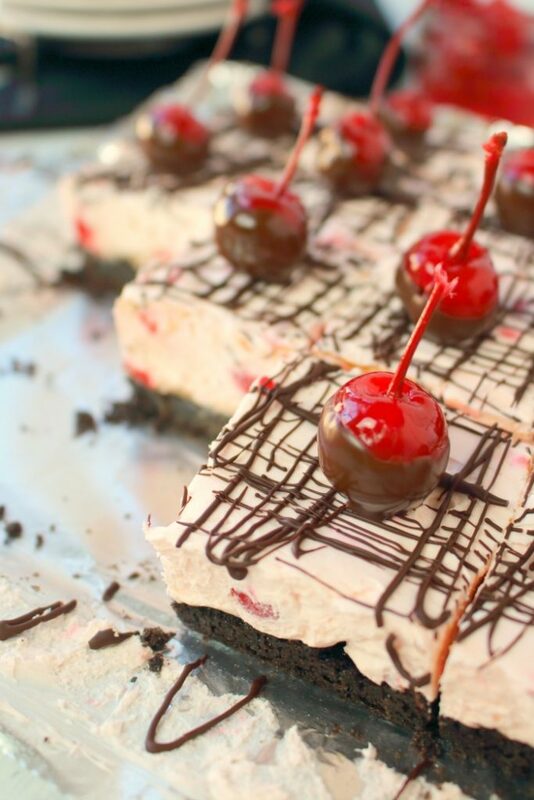 Made with an OREO crust, a creamy no bake cherry cheesecake filling, and topped with a chocolate drizzle and chocolate dipped cherries, these bars are incredible. 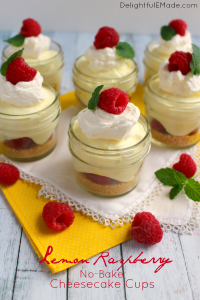 Easy to make, and completely delicious! There is something about chocolate covered cherries that makes my heart melt. The sweet, crisp chocolate on the outside of a juicy, delicious cherry is simply the perfect texture and flavor combination. I feel the same way about chocolate covered strawberries. 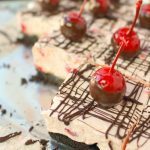 This amazing fruit/chocolate combination inspired me to make these super delicious Chocolate Covered Cherry No Bake Cheesecake Bars! I absolutely love the look of these bars. That pretty chocolate drizzle on top is really easy and effortless. I simply melted chocolate in the microwave, and using a spoon, drizzled the melted chocolate over the top of the bars. I drizzled in one direction, then turned the cheesecake 90 degrees, and drizzled again, thus creating the cool chocolate design. 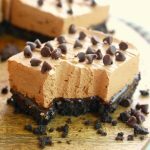 As to not mess up your cool chocolate design, cut the cooled and set no bake cheesecake bars BEFORE drizzling with chocolate. You’ll likely need to run a knife thought the bars again, but the pretty chocolate design will be less likely to break after serving. 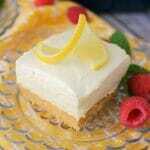 You’ll notice in the recipe that in addition to vanilla extract, I also added almond extract. Any time I’m baking with cherries, almond extract is a natural pairing. 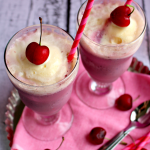 It adds a wonderful, yet subtle, flavor that is absolutely perfect with the chocolate and cherries. If you’re not a big almond extract fan (I know some people are not), feel free to omit. 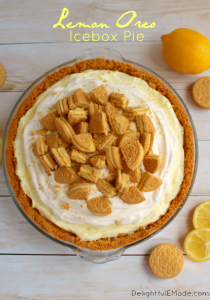 This dessert is a fantastic make-ahead option anytime you want to serve a delicious, no-fuss treat. Your guests will think you picked up this dessert at a fancy bakery, but in reality these no bake cheesecake bars are super simple. 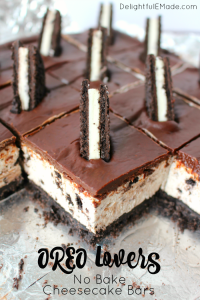 No bake cheesecake bars don't get better than this! 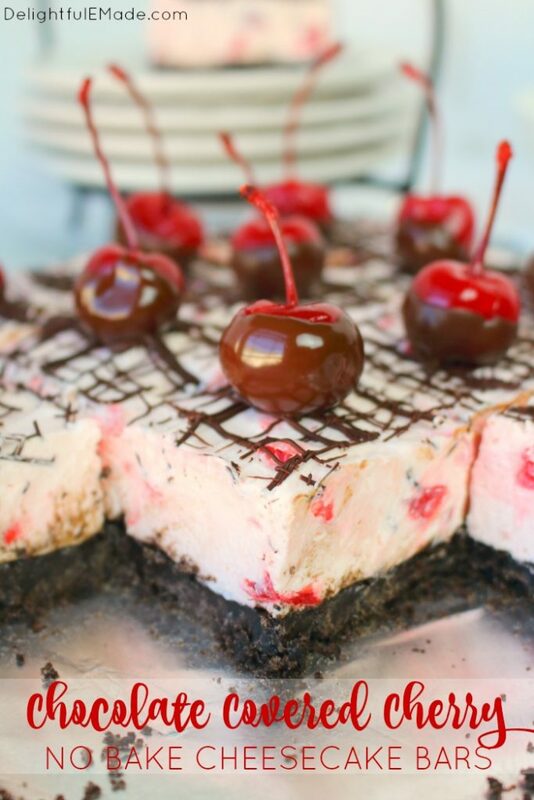 Made with an OREO crust, a creamy no bake cherry cheesecake filling, and topped with a chocolate drizzle and chocolate dipped cherries, these bars are incredible. Easy to make, and completely delicious! Line a 9x9" square pan with aluminum foil. Lightly spray with non-stick baking spray. Set aside. With a hand or stand mixer, cream together the cream cheese and powdered sugar and mix until creamy and slightly fluffy. Add the vanilla and almond extract and mix. Gradually add in the thawed whipped topping. Fold in the chopped cherries, and mix together. Spread the mixture evenly over the top of the crust, making sure to spread firmly and evenly into corners of the pan. Refrigerate for at least 1-2 hours, or until firmly set. For the topping: Melt the bittersweet chocolate according to package directions. 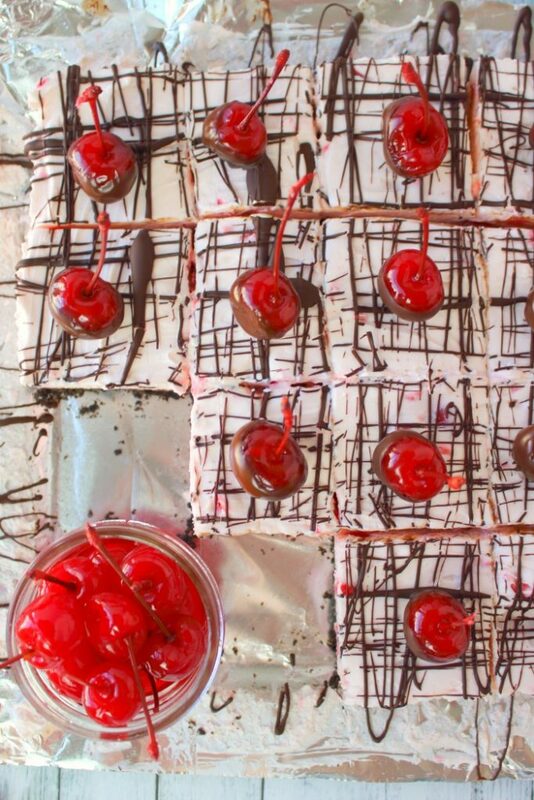 Dip the marischino cherries into the chocolate and place on to a piece of waxed paper to cool and harden. Refrigerate if you need the chocolate to harden quickly. 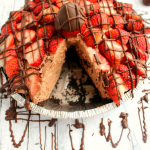 Lightly drizzle the remaining melted chocolate over the top of the chilled cheesecake. 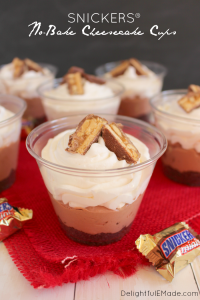 (For an even better drizzle, cut the cheesecake into 16 squares before drizzling the chocolate.) 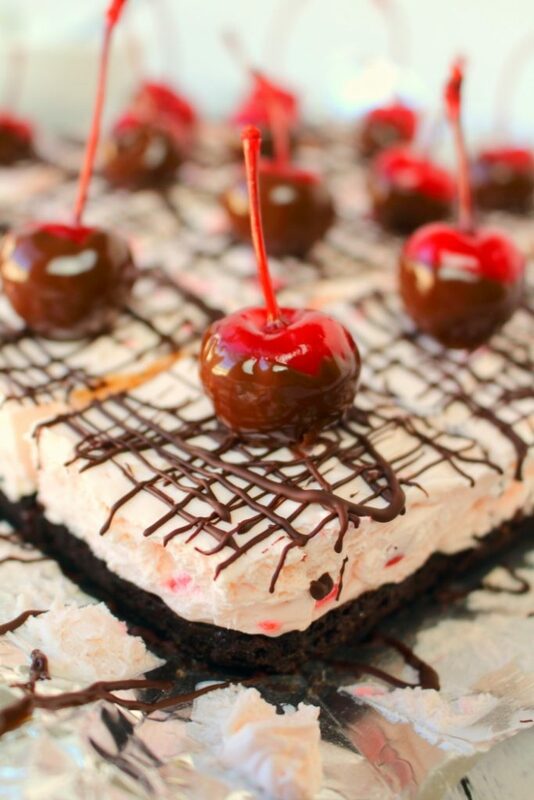 Even place the 16 chocolate covered cherries on top of the cheesecake squares. Refrigerate any leftovers. 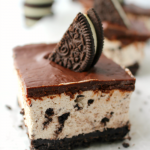 If you would prefer a more firm, crisp crust, bake the OREO cookie crust at 350 for 10 minutes. Let cool completely before adding the cheesecake filling. 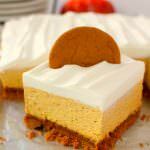 (Yes, I realize this makes the dessert no longer "no-bake", however, a more firm crust will yield more uniform, square slices. Just an option. Right now I'm telling myself that I will make this, have a small piece and give the rest away. More than likely when I make it I will eat way more than I should and enjoy every bite! MMM yummy. Thanks for sharing with us at Family Joy Blog link Up Party this week! How delicious! 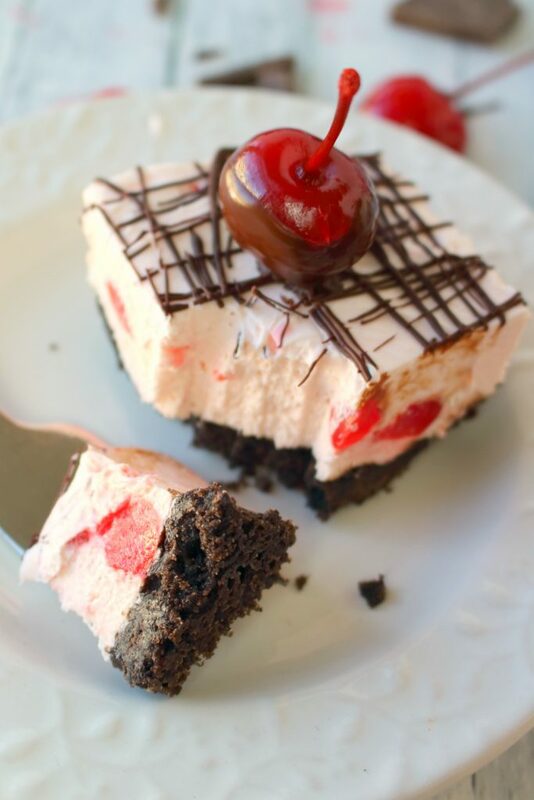 Your Chocolate Covered Cherry Cheesecake Bars are mouth watering! Thanks for sharing at Snickerdoodle. I'll be featuring this at tomorrow's party. Those are really pretty bars - and they sound delicious too! Thanks for sharing at the What's for Dinner party - and have an awesome week!